Background: Timolol is clinically administered topically (ocular) to reduce intraocular pressure and treat open-angle glaucoma. Ocular administration of timolol in low doses (0.5% w/v in the form of eye drops) has led to challenges for in vivo metabolite identification. An understanding of drug metabolism in the eye is important for clinical ocular therapeutics and potential drug candidates. Methods: We aimed to investigate the metabolism of timolol in rat ocular and liver S9 fractions, as well as rat ocular tissue and plasma following a 0.5% topical (ocular) dose of timolol. We explored the potential in vitro metabolic bioactivation in the eye/liver by conducting trapping studies for putative aldehyde and iminium ion intermediates that may arise from the morpholine functionality. Results: Oxidative metabolism of timolol to its major metabolite (M4) in ocular S9 and recombinant rat cytochrome P450 (CYP) isoforms supports the possible role of rat ocular CYP2D2, 2D4, and/or 2D18. Observation of N-acetyl-timolol (M5) is suggestive that the ocular N-acetyltransferases may also play a larger role in ocular disposition of timolol, a previously unreported finding. 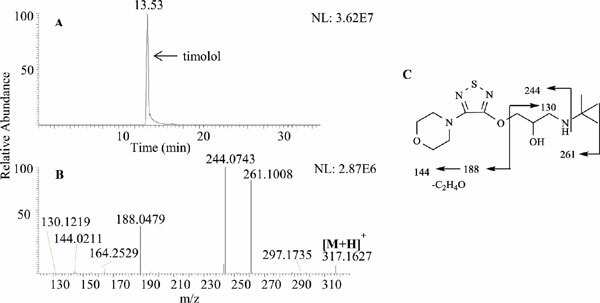 This research is the first comprehensive report of in vitro ocular metabolism of timolol in rat. Conclusion: This study also indicates that in vitro hepatic metabolism is over-predictive of ocular metabolism following topically ocular dosed timolol. The research, herein, highlights the eye as an organ capable of first pass metabolism for topical drugs. Thus, new ophthalmologic considerations for studying and designing long term topical therapies in preclinical species are needed in drug discovery. Ocular metabolism, bioactivation, cytochrome P450, N-acetyltransferase, first pass metabolism, and -adrenergic antagonists.